In the race to replace Attorney General Lisa Madigan, Illinois utilities pull out their checkbooks and hedge their bets: click here to read the report by the Energy & Policy Institute. To read the entire article on www.wlsam.com click here. 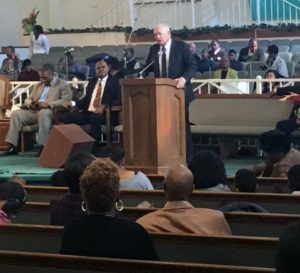 Pat Quinn at the United Baptist Church in Chicago’s West Side. “Dr. King believed in fundamental​ economic ​fairness – in housing, education, healthcare, and employment,” Gov. Quinn said. In January, 1966 – 52 years ago this month – Dr. King moved to an apartment at 1550 S. Hamlin on Chicago’s West Side​, a short distance from United Baptist Church. Dr. King was invited to Chicago to combat discrimination and poverty that inflicted hundreds of thousands of people in the city. The issues of poverty and economic injustice​ that Dr. King confronted are still present today, including the challenge of many consumers trying to afford extremely high heating bills in the cold of winter. Just this week, Peoples Gas was allowed to proceed with a costly plan that will double natural gas bills on consumers​, making it extremely difficult for many people to afford​ to heat their homes​ in the cold winter months. For more information about Donald Trump’s recent comments, click here. [Quinn] said more must be done…. 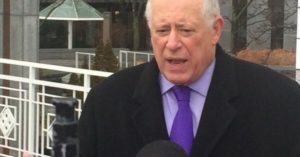 “We’ve got to try to organize a grassroots campaign, in the best Illinois political tradition, to make sure consumers get a fair shake,” he said, waving a copy of literature from the Citizens Utility Board that he founded more than three decades ago. To read the whole article in Crain’s, click here. “The FCC’s vote today to repeal net neutrality rules on a party-line vote is a blow to consumers everywhere. Today’s decision will allow broadband providers to decide what information people can access on the internet and how they are allowed to communicate with one another online.